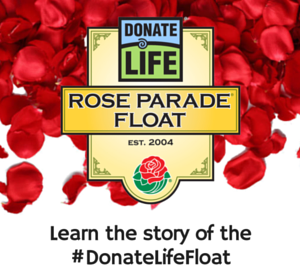 During this year’s Tournament of Roses Parade on Jan. 2, 2017, the Donate Life Rose Parade Float will make its way down the streets of Pasadena bearing people, messages and images that bring to life the inspiring power of organ, eye and tissue donation. 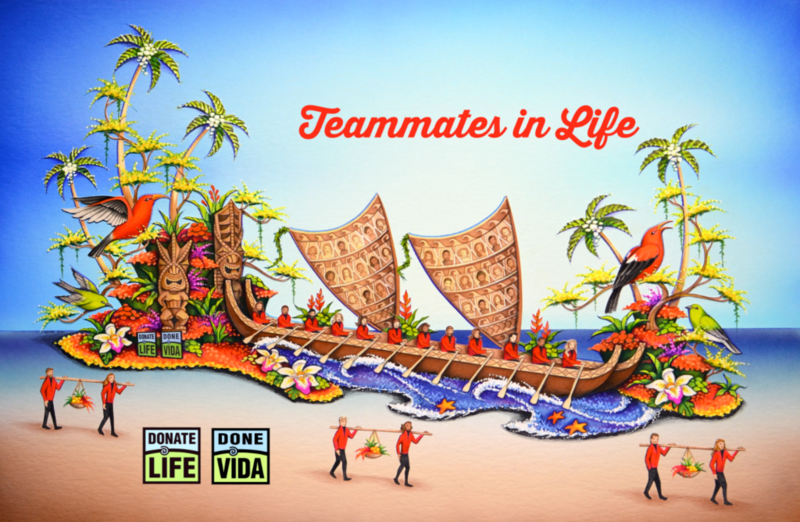 This year’s float is titled Teammates in Life and features a spectacular Polynesian catamaran propelled by a team of 24 organ, eye, and tissue transplant recipients rowing with strength made possible by gifts from their donor heroes. Those walking beside the float are living donors and transplant recipients of living donation. The sails of the vessel will feature 60 floral portraits of donors interwoven with Polynesian designs and patterns. These portraits – called floragraphs – are based on photographs of the donors but are created using only organic materials such as seeds, flower petals, plants and grains. The float is a loving tribute to the many lives touched by donation and transplants. It is a reminder that right now, 123,000 people in the US are waiting the transplants they need to survive. This inspiring display is presented to help those watching to imagine a day when there is no longer a need for a Transplant Waiting List because organ, eye and tissue donation is embraced as a fundamental human responsibility. Until that day, Donate Life Texas is thankful to all those who are willing to share their own experiences as a meaningful way to highlight the lifesaving power of donation. Learn more about the history of the Donate Life Rose Parade Float here. Meet the people from Texas who will participate or be honored on this year’s Donate Life Float here. This year, Texas will be well-represented both on the float and in the stands on the parade route. Donate Life Texas is proud to be represented by Cindy Keel-White, a heart transplant recipient and dedicated volunteer advocate from Odessa, Texas. We invite you to watch our Donate Life Texas social media this month for announcements about the Donate Life Rose Parade participants who will represent the Lone Star State.